I have started teaching the Bible study War Room by Stephen and Alex Kendrick. This has been a very popular Bible study at my church with over 50 students in two different classes. We have never had such a popular Bible study on prayer before. I hope that the momentum for prayer continues after the movie is out of the cinemas. If you have not seen the movie or attended this Bible study, I recommend them both. If you do not daily pray to the Lord, I recommend finding a designated location and time to begin praying now. If you have seen the movie, both Miss Clara and Elizabeth have closet prayer rooms. You might not have the luxury of a spare closet in your home, but any room will do. Find a quiet place and make an appointment with the Lord daily. I recommend starting a Family Photo Prayer Journal to keep Bible verses on prayer, names, photos and anything else which might help you with your prayer time. I have included the Sin List from A-Z as well as the free prayer guides available on this website, in my journal. 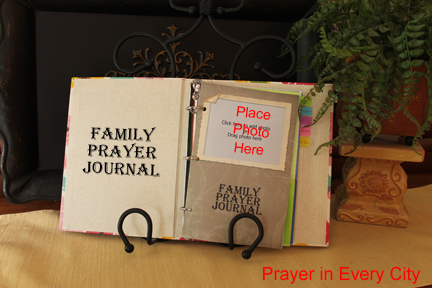 Click here for more pages to add to your Family Photo Prayer Journal. This journal has become a valuable tool for those taking my Bible study as well as my own personal prayer time. All of the items on my blog are available for free, so download any of the pages you would like to add to your journal. I have included a new page for your journal below. When I am praying for my church and the church in America I like to pray Paul’s prayers from the Bible. Many times I realize how shallow my prayers can be as I read these prayers from the Bible. I like to pray these prayers back to the Lord for my own church, but remember that the body of Christ is all believers. Paul said he prayed fervently for the churches of Ephesians, Colossians and all the churches he visited. We should do the same. I have underlined and marked certain words I want you to pay attention to when you read these prayers. Notice that Paul calls the believers “saints”. They are not “sinners saved by grace” as we hear so often today. This phrase seems to give an excuse to sin. Rather than referring to yourself as a sinner, call yourself a saint. You might be surprised at how your behavior will change. I hope you will examine these verses and add them to your prayer journal. Click here for a PDF file of this page: Prayers in Ephesians. If you print the photo below, the dimensions will not fit your prayer journal. Only the PDF is measured to fit your journal, with some cutting. Kendrick, Stephen and Alex. (2015) War Room. LifeWay Press.